Pure white doves symbolise peace, love and a new beginning. Doves are so symbolic for a wedding because they pair for life and both share in the caring of their young. To early Greeks and Romans, doves symbolised love, devotion and caring. The dove was the sacred animal of Aphrodite and Venus the goddesses of love. In ancient cultures, the groom would give a dove to the bride, symbolising his promise to help care for her and her family. These days’ doves are regularly released at weddings as a blessing for the bride and groom. Doves pair up for life, so they are a true representation of love, and the eternal commitment, that a couple have made. The company we use has an experienced dove release attendant, whom we have worked alongside for many years now. They are brought to the ceremony in beautiful ornamental cages, and, they can either be released from here, or if you prefer, you can hold them and release them from your hands. All the doves are trained to return “home” to the supplier. 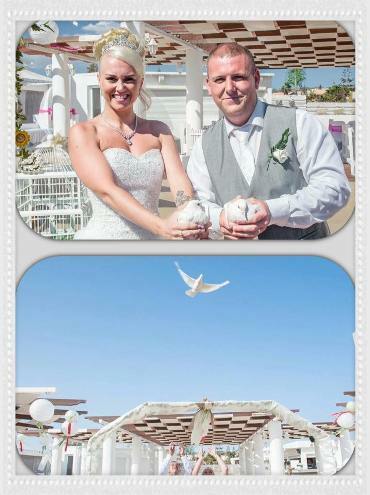 Doves are a great way to add a romantic elegance to your already very special day.